This luxury vacation villa is located in a quiet area approx. 2,5 km. from the centre of Cascais with sandy beach, restaurants and shops. 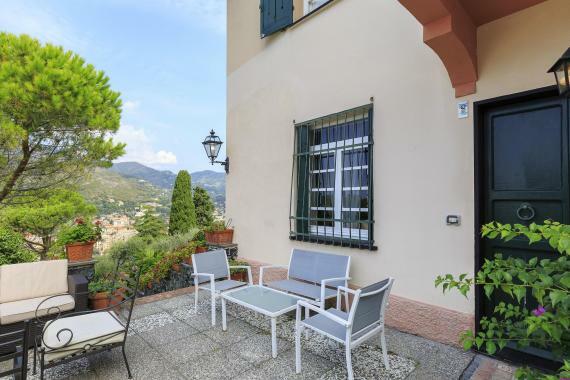 Villa Cassina comprises 2 floors and a separate guest house in the garden. On the ground floor there is a spacious open plan living area with fire place and satellite TV, a dining table for 10 and a fully equipped modern kitchen. Further on this floor 2 twin bedrooms, 2 bathrooms and a guest toilet. On the first floor you will find the master bedroom with en suite bathroom and balcony and 2 double bedrooms each with its own bathroom. The guest house comprises a double bedroom with bathroom. In the well-tended garden with palm trees lies a private pool (9.5 x 5) surrounded by a terrace with 10 sun beds and a sun umbrella. The pool can be heated against a supplement. There is a covered outdoor dining area for 10 with gas BBQ. Vacation villa Cassina is located near Cascais (Lisbon) only 2,5 km. from the town centre with restaurants and shops. Beach: 2,5 km. Restaurants and shops: 1,5 km. Supermarket: 2,5 km. Estoril: 7 km. Sintra: 17 km. Golf: 5 km. Lisbon airport: 35 km. Maid service once a week. Towel and bed linen change once a week.